This universal clamping system allows you to mic up a guitar cabinet in an easy and revolutionary way. The spring-loaded clamping arm makes the clamp suitable for almost any type of cabinet and securely fastens to the side or top of a cabinet or combo amplifier. Thanks to its adjustable edge grip, the clamp can be adjusted to fit snugly onto recessed edges. 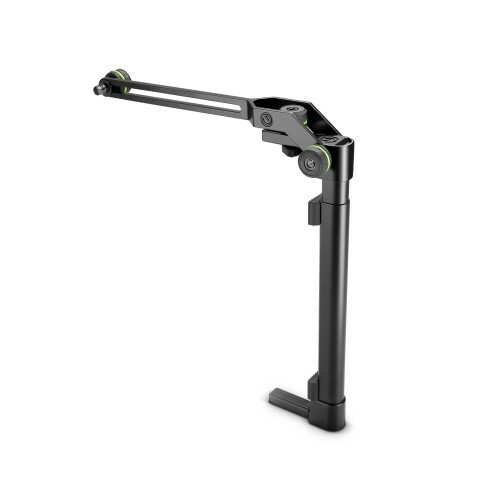 The rigid boom is finely adjustable in both boom angle and microphone depth – this ensures a far more precise and secure mic placement as opposed to using a gooseneck-based clamping system or conventional mic stand.